Is it just me, or does it seem a little odd that we're boarding planes to see family near and far, buying turkeys and all the fixings, and watching the holiday decor turn on around the city? While the marathon seems like it was ages ago (even more than the month and a half that it actually has been) and my last 5K feels long forgotten (maybe that's attributed to the fact that I have no chocolate leftovers), I'm still in disbelief that it's practically Thanksgiving and I'll be chowing down on turkey, er turducken as far as tradition goes in my house, in two days time. But this year, I'm hoping to add another activity to the mix and hope that it finally sticks enough to become a tradition: the Turkey Trot. Getting in a sweat session on Thanksgiving, or any holiday? That's a given: I can't remember a time where I didn't run around outside with my cousins, hike the hill near their house, run along the Lakefront or through my parents' neighborhood, sneak into the secret Spinning class at the gym, or push my way into a crowded yoga studio for a detox class. Besides, it gives me extra justification for the holiday smorgasbord. Healthy or not, you'll find me indulging on the holiday desserts that I swear I have a second stomach for, after stuffing myself full of turducken, green beans and sweet potato. The Turkey Trot is the one event that just hasn't stuck as a holiday tradition. I've never run one in Chicago and came up with about five million excuses not to run the post-Thanksgiving Schaumburg half marathon last year (and thank goodness when the temps hovered around freezing). I've run the Detroit turkey trot once, maybe twice, usually opting to sleep in after making the five-hour drive in from Chicago the night before and not being adjusted to the eastern time zone. And getting my family to run or walk their way to the finish line with me? The chances of that happening are slim to none, even when I grovel and beg. Yes, they're excuses, but at the same time, I suppose I don't need a race to push me out the door to go for a run and then I'm not constricted by the race distance. But this year, the Turkey Trot is on the calendar. Maybe it's because I didn't start my running season until August (thanks stress fracture). Maybe it's because my last 5K left something to be desired (thanks Hot Chocolate). Maybe it's because I have new winter running gear to test out (thanks fashion show). Maybe it's because I've been minimizing my time spent at the gym and not feeling that usual yearn to ride the stationary bike or plod away on the elliptical (thanks winter doldrums). Whatever the case, I'll be testing my feet Thursday morning at my first-ever Chicago Turkey Trot. And with each step I take, I'll remember what I read from Runner's World this morning: "Turkey: great to eat; not great to look like." Good advice, my friends. 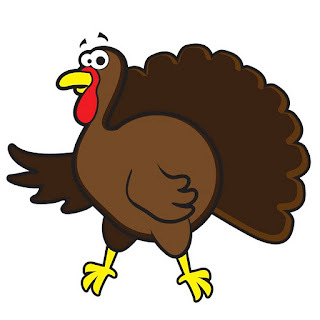 Where are you running a Turkey Trot on Thanksgiving?